A shadowy group called PropOrNot (shorthand for Propaganda Or Not) that has gone to a great deal of trouble to keep its funders and principals secret, is promulgating a blacklist of 200 alternative media websites that it has labeled “Russian propaganda outlets.” On Thanksgiving Day, Washington Post reporter Craig Timberg amplified this smear campaign in an article giving credence to the anonymous group’s research. The widely read Paul Craig Roberts also landed on the blacklist. Roberts is a former Assistant Secretary of the U.S. Treasury for Economic Policy under President Ronald Reagan, a former Associate Editor of the Wall Street Journal and a former columnist at BusinessWeek. He held Top Secret clearance when he worked for the U.S. government. Wall Street On Parade closely examined the report issued by PropOrNot, its related Twitter page, and its registration as a business in New Mexico, looking for “tells” as to the individual(s) behind it. We learned quite a number of interesting facts. 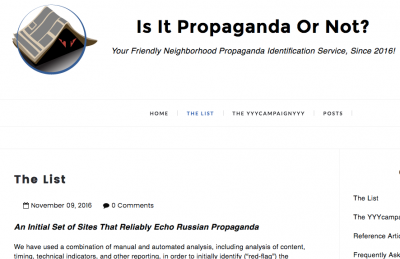 As part of its McCarthyite tactics, PropOrNot has developed a plugin to help readers censor material from the websites it has blacklisted. It calls that its YYYCampaignYYY. In that effort, it lists an official address of 530-B Harkle Road, Suite 100, Santa Fe, New Mexico 87505. That’s one of those agent addresses that serve as a virtual address for the creation of limited liability corporations that want to keep their actual principals secret. The address has dozens of businesses associated with it. There should also be a corresponding business listed in the online archives of the business registry at the Secretary of State of New Mexico. However, no business with the words Propaganda or PropOrNot or YYY exist in the New Mexico business registry, suggesting PropOrNot is using a double cloaking device to shield its identity by registering under a completely different name. 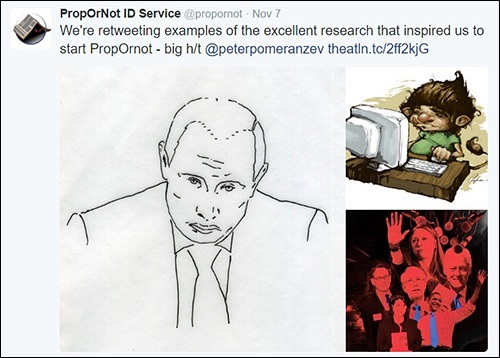 PropOrNot’s Twitter page provides a “tell” that its report may simply be a hodgepodge compilation of other people’s research that was used to arrive at its dangerous assertion that critical thinkers across America are a clandestine network of Russian propaganda experts. Its Tweet on November 7 indicates that the research of Peter Pomerantsev, a Senior Fellow at the Legatum Institute in London, who has also been cooperating on research with the Information Warfare Project of the Center for European Policy Analysis (CEPA) in Washington, D.C, inspired its efforts.